This image, from the Second Alarmers Association's Facebook post on the theft of the plaque, shows the concrete block that is left after the plaque was stolen, along with an image of the plaque itself. A memorial plaque dedicated to a fallen firefighter was ripped from its foundation recently, leading a local first responder support group to ask the public to help keep an eye on similar sites. 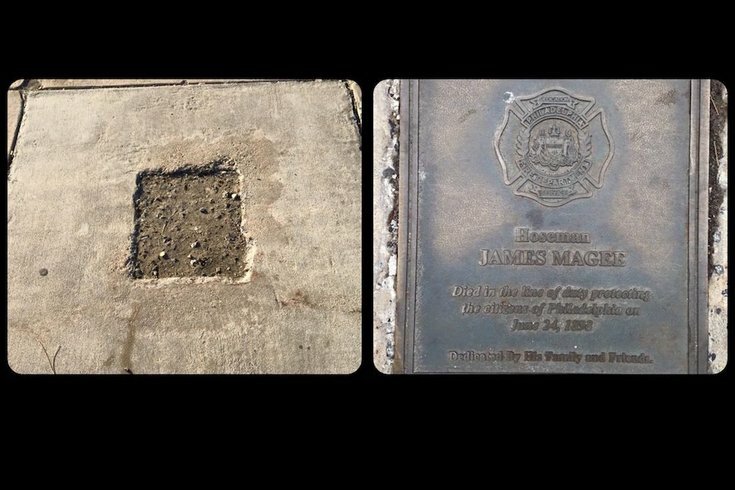 On Friday, Philly Fire News shared a Facebook posting from the city's Second Alarmers Association, an East Falls-based association that works to provide food and drink to first responders at emergency scenes, that showed that the memorial plaque for firefighter James McGee had been pulled from its concrete housing. The plaque, installed at Second and Erie streets in North Philadelphia in 2006, remembered McGee, a hoseman who died on June 24, 1898 while fighting a fire at the Thomas Potter Oil Company. According to Harry McGee, great-grandson of the fallen firefighter and himself a veteran Philadelphia firefighter with 40 years in the department, said the cost to replace the plaque could run between $1,500 and $2,000. A Daily News article on the plaque's dedication said that McGee, a member of Engine 45, died while fighting a blaze that took two days to extinguish and injured at least 12 firefighters. He was 35. On their posting, the Second Alarmers Association called the theft of the plaque a "disgrace." "What a disgrace that someone would have the audacity to remove this memorial from hollowed ground to honor one of our responders who made the supreme sacrifice for the citizens of this city," the organization wrote. The younger McGee, who was curator of Philadelphia's Fireman's Hall Museum, but is now retired, said his family has been working to raise funds needed to replace the plaque, but they will find a new site for it to be installed. "It won't go back to that location. It can't be protected there," he said. Instead, McGee hopes to have a replacement plaque installed at the Engine 45 fire station at 26th and York Streets, where his great-grandfather served, and where his great-grandmother was a matron for the fire department, he said. Matrons were historically widows of firefighters who worked to help clean and maintain fire stations. McGee noted that he had been told that there was some damage to the plaque in the months before it turned up missing. He said that, with similar memorial plaques dedicated to fallen firefighters and police officers at locations throughout the city, local residents need to look out for signs of damage to make sure more of them do not disappear. If you know of a plaque that is missing or damaged, McGee said he's looking at putting together a list of similar memorials in need of repair. He can be contacted at hjmcgee2@gmail.com.